Bahrain Juffair furnished four bedroom villa rent. Juffair furnished four bedroom villa rent. 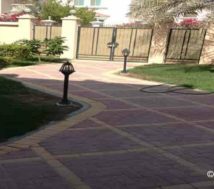 This furnished four bedroom villa is close to the American Alley in Bahrain. A cosy and compact private home that would suit for a medium families especially for expatriate families. This beautiful compound consist of 3 and 4 bedroom villas. The 4 Bedroom private villa is with front garden and with community facilities. The ground floor is with large living room, fitted kitchen and with a medium room. This compound is located near to the US Naval base (NSA Bahrain) and close to the main road. The rent for the 4 bedroom villa is Bahrain Dinar 1500 per month, inclusive of electricity and tax. The rent for the 3 bedroom villa is Bahrain Dinar 1200 per month, inclusive of electricity and tax. An advance of three months rent has to pay when signing the agreement. The next rent payment is due on the fourth month. These houses are with easy access to the two highways and close to the supermarkets, coffee shops and hotels. The compound is with four side wall and with 24 hours security. Manama, Marina beach and Adliya.